Regrettably 11th February this year falls on the first Monday of Lent and is hence a Feria with only a Commemoration of the Apparition at Lourdes. p.s. - I should have said England's greatest non-martyr Cardinal - of course St. John Fisher died a Cardinal. Vernon, how old calendar you are! With good pastoral reason, why, ANYTHING is permitted in the new dispensation. Here in Rome, a mere few years ago, in the Chiesa Nuova, the feast of S. Philip Neri displaced the coinciding Solemnity of Pentecost! Why, you may ask? Well, 'cause they said so! Father - obviously my first post got lost - my question was: will there be any special celebrations for the 450th Anniversary of England's second greatesr Cardinal - and if nothing is planned - will you do something? Owl of the Remove - I think I did hit the publish button for your first post but I was using my father's very old computer, which doesn't always co-operate with blogger. Anyway, I'm not aware of any celebrations for Pole's anniversary - I suppose people are more likely to celebrate the 400th or 500th anniversary of his death as opposed to the 450th. Also it is eleven months away, and things may emerge as the year progresses. There are occasional Catholic Masses in Canterbury Cathedral and perhaps one of these might be a Requiem for the Cardinal. 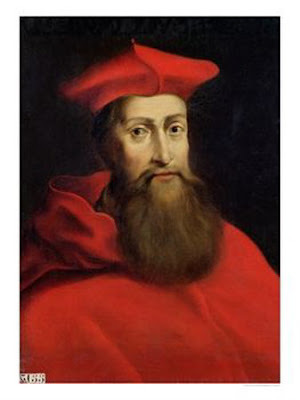 Interested to hear that you consider Pole the greatest of our non-martyr Cardinals. He is certainly a contender, though others would posit Langton, Allen, Manning and Newman. And, of course, the irony is that Pole was facing investigations for his supposed Lutheran sympathies at the time of his death! I am a particular fan of Cardinal Manning and, of course, soon to be beatified (D.V!) John Henry Newman - however, because of the times - and having a martyr for a mother - Pole pips the post. I always venerate his tomb in Canterbury Cathedral every year when I come home - even though they won't let you get close enough to actually pray beside it. I will be dead for his 500th Anniversary! This year also marks the 40th anniversary of Humanae Vitae. Worth celebrating? Thanks for reminding us about HV. I was only concentrating on centenaries and half-centenaries. Pole has always been one of my favorite historical figures. I enjoyed peeking into his titular church in Rome, Sta. Maria in Cosmedin. Britain - a Catholic Country?